Did the Africa Growth and Opportunity Act work? The African Growth and Opportunity Act (AGOA) reduced U.S. trade barriers for goods from African countries that met certain conditions. The objective was to give their economies a boost. Did it work? New research by Garth Frazer and Johannes Van Biesebroeck suggests that it did: Trade Growth under the African Growth and Opportunity Act (NBER working paper 13222, July 2007). Botswana has been able to build a remarkable growth record on its diamond endowment, without falling victim to the resource curse (How did Botswana avoid the "resource curse"?, Ben Muse Oct 17, 2006). Yet there is another, more pessimistic side to the story of Botswana’s development. To put the matter simply, diamonds have produced distorted development. Most obvious has been the limited economic spin-off in terms of employment. Debswana, the diamond mining corporation owned jointly by the government and DeBeers, employs about 6,500 people, or just 2 percent of the workforce. To be sure, there is significant secondary employment generated by the company’s contractors and consumption by Debswana employees. The bottom line, however, is that after decades of rapid GDP growth, about 40 percent of the working age population is unemployed. Apart from the diamond industry, no other economic sector has experienced much growth. In the meantime, the educational system, well funded by diamond income, annually churns out large numbers of students who cannot find jobs, even when they have a university education. Top planners in the education have concluded that government must restructure the system to prepare youth for export to the global economy, since few jobs will be available inside the country in the foreseeable future! re "hunky-dory" see also : World Wide Words. Michael Quinion writes on international English from a British viewpoint and Answers.com. How did Botswana avoid the "resource curse"? 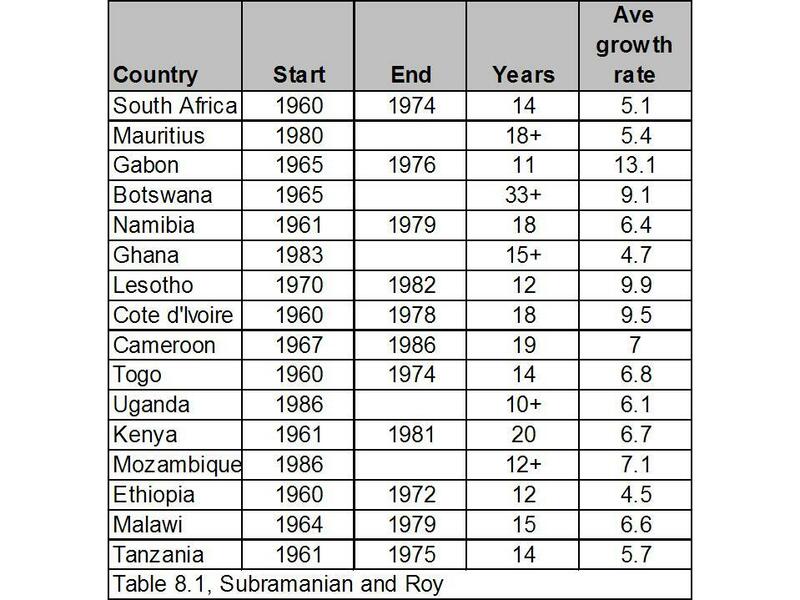 Little, land-locked Botswana has had one of the best growth records in the world (What happened in Botswana?, Ben Muse, Jan 9, 2004). Finding diamond mines didn't hurt. But many countries have been unable to leverage rich natural resource endowments into growth. Many think that under some conditions resource riches can lead to lower growth rates. This is the resource curse. Why was Botswana different? New research is suggesting that UN estimates of HIV infection rates in parts of Africa may have been high. The new research also indicates that AIDS remains a very serious public health problem in much of Africa, and Southern Africa remains an HIV/AIDS disaster. ("Who Can Explain the Mauritian Miracle? Meade, Romer, Sachs, or Rodrik?," from In Search of Prosperity. Analytic Narratives on Economic Growth, edited by Dani Rodrik. Elsa Artadi and Xavier Sala-i-Martin think the "worst economic disaster" of the 20th Century was "the dismal economic growth performance of the African continent." (Artadi, Elsa V. and Xavier Sala-i-Martin, "The Economic Tragedy of the XXth Century: Growth in Africa." National Bureau of Economic Research. Working Paper 9865. July 2003. Accessed at http://papers.nber.org/papers/W9865 on July 23, 2003).